'The Posters of...' series, published by Double Crown Books, is a collection of books dedicated to showcasing historic illustrative artwork in entertainment advertising. 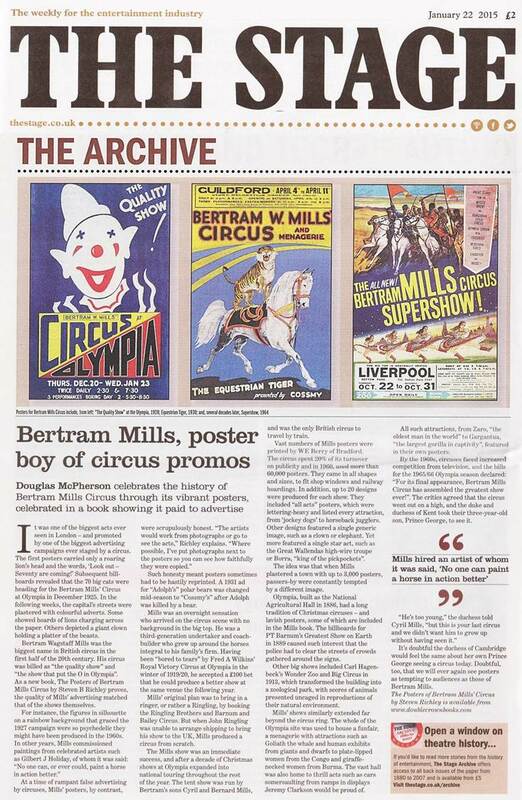 The first book in the series was 'The Posters of Bertram Mill's Circus' published in the Autumn of 2014. Bertram Mills’ Circus all started with a wager in 1919. After visiting a circus at Olympia, London, Bertram Mills was asked for his opinion of the show - he replied ‘If I couldn’t put on a better show than that, - I would eat my hat.’ A week later he had agreed to stage a circus at this famous West-London site for the 1920-21 season - a tradition that would continue for the next 48 years and mark the revival of the UK circus scene. 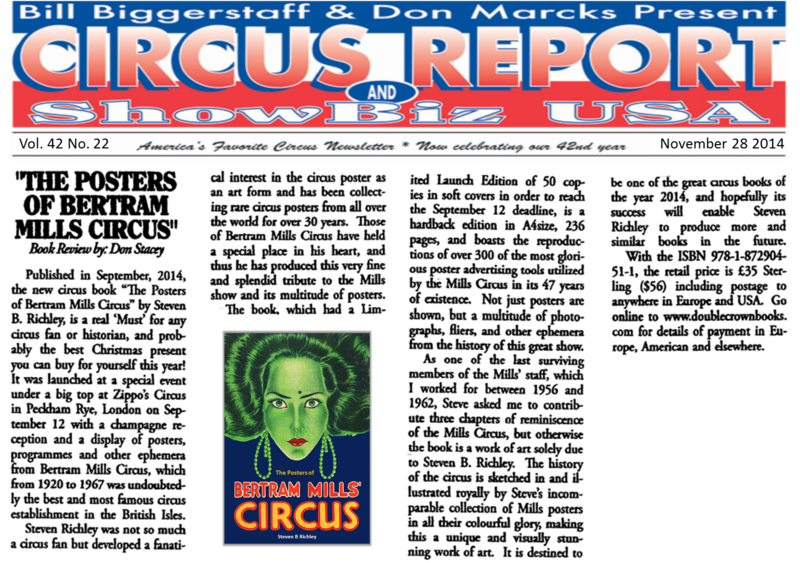 Featuring over 350 posters, hanging cards and other rare items of circus ephemera, this book tells the story of the Bertram Mills Circus through it’s amazing promotional artwork. It covers Mills’ initial shows at Olympia, tenting as a joint venture with The Great Carmo in 1929 prior to going on the road with the Mills’ circus ‘under canvas’ from 1930. Completing the story are posters from Mills’ Circus’ travelling the length and breadth of Britain via train until 1965 and the post-war shows productions at Olympia until 1967. Beautifully produced, Steven Richley’s story of the Posters of Bertram Mills’ Circus is far more than a parade of designs and artwork to please the aficionado. Of course, the most avid circus fan will love it. But this is a work which bridges the gap between the specialist history and the ‘good read’. It’s not only for the fans – it’s for everyone. The posters are all there, sourced like the performers of this greatest of circuses from far and wide - a unique assemblage of exotic expressions and impressions of the circus arts - but we also learn about their origins, their designers, the celebrated artists whose paintings and style often added an extra dimension to the advertising of ‘The Quality Show’. And we meet the people behind the ‘bills’, notably Messrs Cyril and Bernard Mills and their illustrious founding father, as well as many of the human and animal performers whose work is central to the history of this most universal of all art-forms and this greatest of sawdust splendours. Steve’s achievement is to let us glimpse the historical and cultural setting of Bertram Mills’, in its origins and in its fine history. As such, his book belongs as much on the Social History shelf as in the Circus Arts section. Like the much-respected circus itself, the book is to be admired for the remarkable thoroughness and depth which have gone into its production. Congratulations, Steve – you have brought Bertram Mills’ Circus back to life in a form to be treasured. Chris is a performance deviser and director, circus ringmaster, marketer and PR, actor, radio journalist, and more! He has worked for the biggest circus names including Billy Smart's, Gerry Cottle, The Moscow State and Zippo's. "A splendid collection of the greatest pictorial advertising posters"
"The posters in this book are truly stunning - beautiful artwork and also powerful as they are evocative of a circus life long gone"